Frankie and Clover's Strictly Come Dancing Blog! : Line them up and watch them go! Line them up and watch them go! So here we finally are, it's been a funny old lead-up to the start of the series - what with no-one knowing who the pros were going to be, was Aliona in or out, will the press ever give up on its hilarious delusion that Daniel Craig would ever do Strictly? This confusion has put a bit of a dampener on the rumour mill this year, but now we're finally off with a lovely batch of new pros to dissect...er, welcome, that's the word. Seriously, UK Twitter legend Ed Balls guys. Oh yeah, and apparently he used to be a politician. Our track record on Strictly for politicians is not great - Vince Cable may have put in a steady waltz, but Edwina Currie just sat on a chair and pointed her toe. And we continue to pretend Widdy never happened because we can't pay for therapy out of the licence fee. As for Mr Ed, he seems to be having quite a calm mid-life crisis, going on Bake-off and generally appearing like a normal human being. The Vines of him doing serious dad dancing at least shows he has basic rhythm and enthusiasm, so he stands a chance of a good few weeks. I feel like he would have been a shoo-in for Kristina. Our first girl is very much in the Caroline Flack stable of contestants, not massively-well-known TV presenter who seems pretty plucky. I also stood next to her in a lift on holiday in Malta last year when she was presenting at an MTV summer festival, and if that's not a claim to fame I don't know what is. I see her with a new male pro, just...because. I remember seeing Ore doing the sport on the BBC a few times and somehow just KNEW he'd end up on SCD someday. My next hot tip is the business presenter Victoria Fritz, you heard it here first. Ore is also a Newsround veteran, where I think it's contractually obliged to be an all-round good egg. Also, that video he made of himself dancing to Hot Stuff whilst checking his tweets showed more basic skill than some contestants who've had a week to train. Could be a dark horse, this one. Not going to lie, this was the first contestant that made me go "Who?". In case you're wondering, see the Xtra Factor and presenting the breakfast show on Kiss FM. Also, he did CBBC, which gives you the valuable SCD skill of 'mucking about on live TV' - if you're lucky Brucie will chase you with a broom. Wikipedia also tells me he's 5ft 4, so I'm expecting him to be with Janette, or maybe Natalie for a laugh, who knows? She needs no surname, for she is The Right Louise! We were very confused when a YouTuber started the hashtag #GetLouiseOnStrictly, but she was The Wrong Louise. Hoping they go down the 90s route for Mrs Redknapp, we need more in our age group these days rather than trying to appeal to the young 'uns. Plus nostalgia also beats going on about her new cooking ventures. There is also the rather awkward fact that she was a judge on SYTYCD, although I suppose that might matter more if anyone had actually watched it. I am going to say she will dance with...Pasha? A much welcome surprise, I don't think I heard any Naga rumours, but so glad she's come on board. We love a BBC newsreader, statistically it's the only day job you can still do and win SCD, not that we're setting the bar high here or anything...Also, she's a pretty good golfer and it would be good to salvage their reputation from the spectacular low that was Tony Jacklin. Bring it on Naga. It's a bona fide worldwide popstar, hurrah for her not being a thankless tabloid rumour! I love how we all get in a tizz when an American appears on the show, we're like WW2 factory girls getting giddy when the GIs come over. She can't possibly be as bonkers as Michelle Williams. Probably. Everyone seems very excited about this signing, and I'm sure great care will go into her pro partner, here's hoping she's got some natural skill! So this was one of those people where everyone knew who they were and got really excited, and I had no clue whatsoever. And I always watch Olympic gymnastics. So she is very young, and very very tiny, and Italian - where is Vincent when you need him?! Olympic gymnast is a bit of a niche category, but a category that has done very well previously. Sorry to be pedantic, but he isn't actually a judge, the inverted commas may stay all series depending on how much we like him. I've never watched a show (I don't think I've even seen an advert for it) but apparently it's massive with students - smooth move BBC. There's also already a conspiracy claiming the BBC is playing the long game for roping in his BFF Benedict Cumberbatch. Why do I get the feeling he's going to be paired with Joanne? Hurrah, Tameka is finally here! She was asked previously but had to pull out due to being pregnant, so glad the BBC stayed interested in getting her on the show. Watch her marvellous Lady Gaga routine from Lets Dance for Comic Relief if you don't get why people are excited, anyone who can do those moves whilst simultaneously making sandwiches definitely deserves a place on SCD as the obligatory Eastenders contestant. 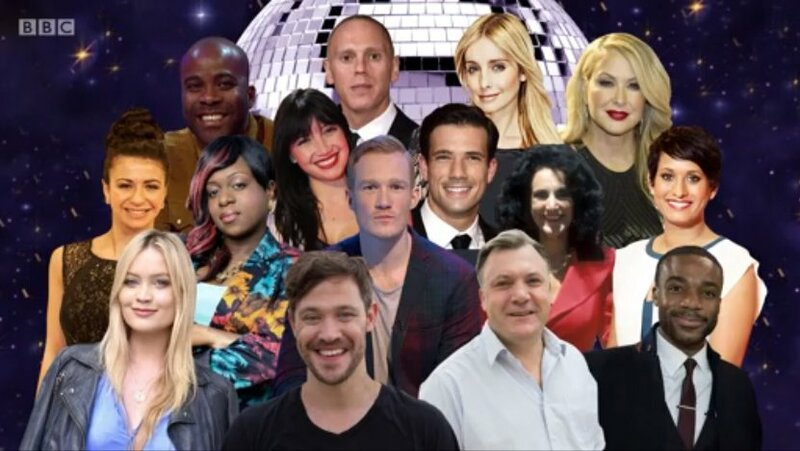 Possibly the worst-kept secret in SCD line-ups ever, with celeb friends openly asking 'when are you being announced for SCD?' on Twitter, great work guys. But who cares, it's a fabulous signing, someone had better start creating those leopard-print outfits pretty sharpish or we will all be disappointed. I have never seen this woman having anything but a jolly good time, and her theatre experience makes me think what whilst her dances might not be the most technically achieved, her performances will be great.